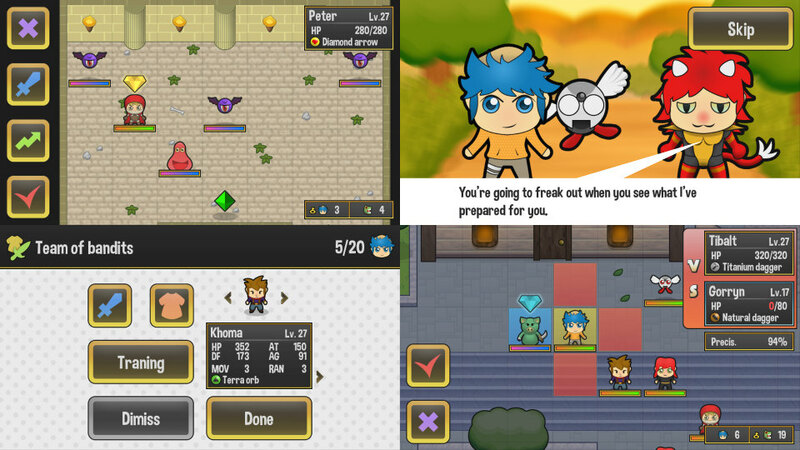 Create a band of thieves and recover your jewels in this tactical RPG! Once upon a time, in a realm where people lived happily, monsters stole the crown jewels of the king Tibalt. He had to become a villain to survive in his castle, but he got tired of stealing and marched on an exciting adventure to reclaim his gems and return to his royal life. Help Tibalt and his friendly robot Darien to recover his gems creating a villains team in this free tactical RPG! Recover gems in battles with the purest role-strategy games style: board-like movements and actions. Fight against other players' bands and make your team the best one. Complete your collection by defeating monsters and discovering new characters. Over 150 weapons and armors to equip. Create your own strategy with 10 magic elements to win the hardest battles successfully. Free, with no time/lives limits in the entire main quest. New training feature in the team menu. New battle field preview feature. 2 new online Bands Battle maps.